This Basic Set 50 pieces is perfect to start your Clicformers adventure. Immediately, you discover several possibilities of this fun toy in lively colors. This is a durable construction toy appealing to children. With this 50 pieces set, you can build all classics like a car or a plane, but also the most strange figures you can imagine. Clicformers construction toys are ideal for the development of the eye-hand-coordination of little children, but also to stimulate the creativity of young teenagers. With Clicformers, children create their own world. Fun and educational toys offering hours of play fun and that keep on inspiring children from 4 to 12 years old. 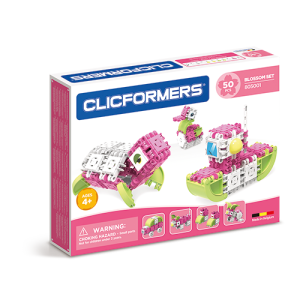 Clicformers grows with your child because all the packages are mutually combinable. In this way, toddler toys become a smart investment which will be experienced as a fun toy years on. 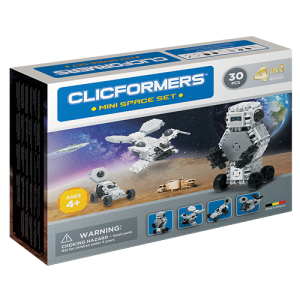 With this Clicformers packaging, you easily build a car because the 22 included accessories also contain little wheels. We’re convinced that the cute penguin will steal your heart immediately, because with those sweet eyes, that animal is really irresistible. And your new Clicformers are also irresistible, because they keep on fascinating. It is incredible how many figures you can build with 28 Clicformers blocks and 22 accessories. Especially when you know that there are stickers inside the box to finish your creations! Do you have plenty of imagination? Well, get to work right away with this amazing construction toy. Lack of inspiration? You’ll find plenty of ideas and building plans in the booklet that comes with the set. So anyway, this fun toy will assure you lots of play and fun for your children from 4 to 12 years old for years to come. Are you looking for the most fun, educational toy? Which is also extremely strong and durable? You have found it with Clicformers!